Unfortunately there will be minor disruption to service today. The 07:30 Bristol Airport to Bath A4 Air Decker will not operate-apologies for any inconvenience caused. Keynsham Winter Festival will be taking place Friday, November 30th 2018. 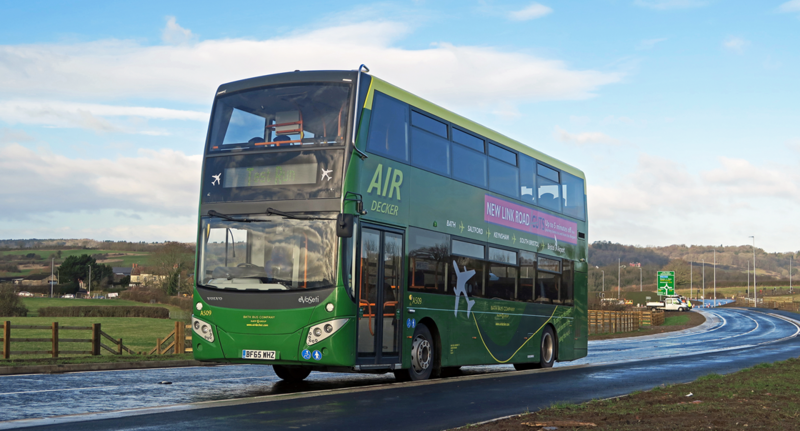 Due to road closures and possible delays owing to large volumes of people expected on Friday, the A4 Air Decker service will be diverting via Keynsham Bypass. All departures after this will be diverting via the Bypass and not serve Keynsham. All departures after this will return to the normal route through Keynsham. Passengers are advised to board and alight at Ellsbridge House or Hicksgate Roundabout during the times of the diversion. This entry was posted in Uncategorized on November 26, 2018 by Connor Flavell. The A4 route will return to normal this evening. The diversion that has meant the A4 service has not been serving Hengrove/Hartcliffe from 18:00 in the evenings will no longer be in place. Please note that the Hengrove Leisure Park bus stop is still suspended due to roadworks. This entry was posted in Uncategorized on November 20, 2018 by Connor Flavell. Please note that there will be a diversion in place this evening for all A4 journeys departing Bath and Bristol Airport from 18:00 onward. The A4 will not be serving Airport road between Wells Road and Hartcliffe Roundabout- this is due to an incident that occurred on Sunday 11th November. We are unable to serve Beechmount Grove and Hengrove Leisure Park. Buses will be diverting via Wells Road, Ridgeway Lane & Whitchurch Lane in both directions. Once the matter has been resolved, normal service/ route will resume. This entry was posted in Uncategorized on November 19, 2018 by Victoria. Please note that there will be a diversion in place this evening for all A4 journeys departing Bath and Bristol Airport from 18:00 onward. The A4 will not be serving Airport road between Wells Road and Hartcliffe Roundabout- this is due to an incident that occurred on Sunday evening. We are unable to serve Beechmount Grove and Hengrove Leisure Park. Once the matter has been resolved, normal service/ route will resume. It is now anticipated that this closure will be in place up to and including Sunday 18th November. We will update our blog (www.airdecker.com/blog) and twitter page accordingly. This entry was posted in Uncategorized on November 15, 2018 by Victoria. In addition to the diversion currently in place, Hengrove Leisure Park bus stop (served by the A4 travelling towards Bath) will be suspended from 14th November 2018 for approximately 4 weeks. This is due to ongoing road works. Unfortunately it has been deemed that there isn’t an appropriate temporary stop. Therefore passengers that would normally board here are required to go to the previous stop, which is located just after Hartcliffe Roundabout. We will continue to update our blog and twitter feed https://twitter.com/A4AirDecker?lang=en-gb. This entry was posted in Uncategorized on November 13, 2018 by Victoria. Please note that there will be a diversion in place this evening for all A4 journeys departing Bath and Bristol Airport from 18:00 onward. The A4 will not be serving Airport road between Wells Road and Hartcliffe Roundabout- this is due to an incident that occurred on Sunday evening. Please note that all journeys this evening departing Bath and Bristol Airport from 18:00 onward will not be serving Airport road between Wells Road and Hartcliffe Roundabout. It is likely this diversion will be in place tomorrow evening in addition to tonight. This entry was posted in Uncategorized on November 12, 2018 by Connor Flavell. There are road closures this coming Sunday in the centre of Keynsham that will be in place for the duration of the Remembrance Parade and Service. During this time the A4 service will be diverting along Keynsham Bypass and not serving Keynsham Town Centre. This entry was posted in Uncategorized on November 7, 2018 by Connor Flavell.